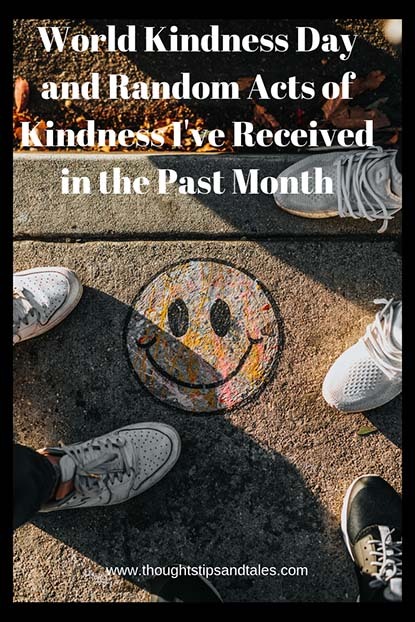 World Kindness Day is celebrated November 13, and to commemorate that day I want to pass along the much-appreciated random acts of kindness that people in my world have done for me in the past month. 1– I took my car to the shop because it had been decelerating — especially when I took right turns and went up hills. (Thank God it didn’t happen when I had to evacuate during Hurricane Matthew with my elderly parents recently!) It got so scary that when it happened as I entered the security gate at work, I did a U-turn and took it to the dealer’s service department instead of going to work. The service advisor, Ansley, was incredibly kind and helped me get a free loaner car (which they don’t always give). Since I live 25 miles from the dealer and the car would be in the shop several days, that was huge! She kept me updated on the repair status during the next few days and actually seemed like she cared about my car and me. Unfortunately, the first thing they did didn’t work. But before I discovered that and when I took the car home that day, I stopped at a body shop to get an estimate for a big dent I’d put in the back of the car recently — since it was a weekday near the end of the work day and they’re closed on weekends. I was heartbroken because I thought repairs would be at least $1,000 based on another accident I’d had lately (!!) that was quite expensive to repair. When the man came out to give me an estimate, I waved my arm to show him the dent in the car — and it was gone! What happened? I kind of thought I was losing my mind… although he told me sometimes heat can cause dents to disappear. When I had to take the car back to the dealer a second time because the decelerating problem wasn’t fixed, the service manager, Adam, had me take it for a ride and explain to him exactly what was happening. Of course, I couldn’t get the car to decelerate when he was in it! But I really appreciated that he went to that effort to get it right so he could fix it. During the ride, I mentioned how I’d had a big dent in the back near the brake light and it had miraculously disappeared. I couldn’t believe it! He not only pounded out the dent, but didn’t charge me and didn’t tell me about it! They gave me another loaner car, too, which, again, I truly appreciated. When I picked the car up Saturday morning (exactly on time, as promised), the service advisor told me they’d discovered the problem; condensation was dripping inside a tightly sealed tail light onto a computer sensor that told the computer the brakes were on — therefore, the car decelerated. The service manager drilled 4 holes on the inside of the tail light compartment to fix it. And he didn’t charge me anything. That has to be the best car repair experience ever! Everyone there was so incredibly helpful and kind! 2– I wrote a blog post about tips for broken legs and ankles, and a reader wrote the nicest comment! It made me feel good for days. –I’ve been going to the same Hardees drive-through for 19 years after work every day to get a Diet Coke and one of the current employees, Lemaine, is so incredibly friendly and nice. I go to Zumba class on Wednesday after work and used to ask for ice water, too — and now when I pull up to the ordering station on Wednesday, before I can ask, she asks me, “Do you need ice water today?” It’s just amazing that she remembers and takes the initiative to ask me. 3– My parents live in an independent living retirement community nearby, and I’m there very often. The woman at the front desk, LaQuantas, is a Godsend! She’s always upbeat, shares a running conversation with me, and has this megawatt smile that makes you feel great. She brightens every visit! 4– I went to a Goodwill grand re-opening after a recent remodel a few weeks ago, and that night someone called to tell me I won a contest they had that day for a $250 gift certificate! 5– A friend, Alice, from my book club, bought my dinner when several of us went out recently because she said she was impressed with my story about evacuating with my elderly parents several weeks earlier. (You have to do what you have to do — but it made me feel really good that someone noticed and appreciated an effort that had been very stressful for me.) It was so sweet of her! 6– I go to the McDonalds drive-through near my parent’s retirement community very often (again — that Diet Coke addiction…) The young male cashier is very personable, and he always calls me “baby doll”! I’m old enough to be his mother and some people might be offended, but it puts a smile on my face every time. He’s just trying to be friendly and I appreciate it! What random acts of kindness have you received lately? Finding Female Friends Online: Don’t Laugh, it Works! This entry was posted in life and tagged kindness, random acts of kindness, world kindness day. Bookmark the permalink. It’s so uplifting to read about nice things happening to people for a change instead of arguing and animosity! Your car fixing journey was truly the most uplifting to read. Most folks don’t trust mechanics and they have a bad rep. Thanks for sharing! You’re right about the mechanics thing! Every time I look at the back of my car — without a dent — it makes me smile! It was an amazing experience. Such nice ways to lift your day! I love the story about the dent! And the Diet Coke and ice water! You’re right — that dent story is amazing — especially done by someone who’d never met me before in his life. I told several of the people that I wrote about them, so they’d know how much I appreciate their kindness and attention. Want to print a copy of the blog post for a couple so they can show their boss when it’s time for raises! What a great message, everyone could use some more kindness. Thanks for sharing.